In health care, high-value care means receiving high-quality care at the right price that leads to the best possible health outcome and reflects your values and needs. We put a lot of work into finding value when it comes to other major purchases. We should all be savvy shoppers when it comes to our health, too. You have the right to demand high-value care at every step. Compare the quality and patient experience scores of medical groups and hospitals in your network at www.wacommunitycheckup.org. Then, make sure your preferred providers are in your health plan’s network. Do your homework. Come prepared with a list of issues and questions that are important to you. Create a family health history with tools your doctor’s office provides you or using My Family Health Portrait from the U.S. Surgeon General. Your health history could play a role in tests your doctor recommends. Research a condition you’re facing so that you are better able to talk to your doctor about it. Ask questions and take notes. Make sure you understand your diagnosis and any recommended treatments before you leave your doctor’s office. Listen to your doctor and repeat back what you hear in your own words. Ask about cost of the treatments and whether there are alternatives to any recommended test, procedure or recommendation. Stay on top of your health by following your doctor’s advice and taking prescribed medications. Make sure your providers and hospitals are in-network for any recommended follow-up procedures. Follow through with discharge instructions and watch carefully for any side effects or other problems, and record them. If your expectations aren’t being met, talk with your doctor about your concerns or think about finding a new doctor. Your relationship with your primary care provider is vital to your health. The better your relationship with your doctor, the more likely you are to get the right care and avoid unnecessary, costly procedures, tests and referrals to specialists. Quality + patient experience + cost are components of health care value. Learn more about how to find high-value health care and how to be a savvy health care shopper. This post is the fifth in a series called The Savvy Health Care Shopper. 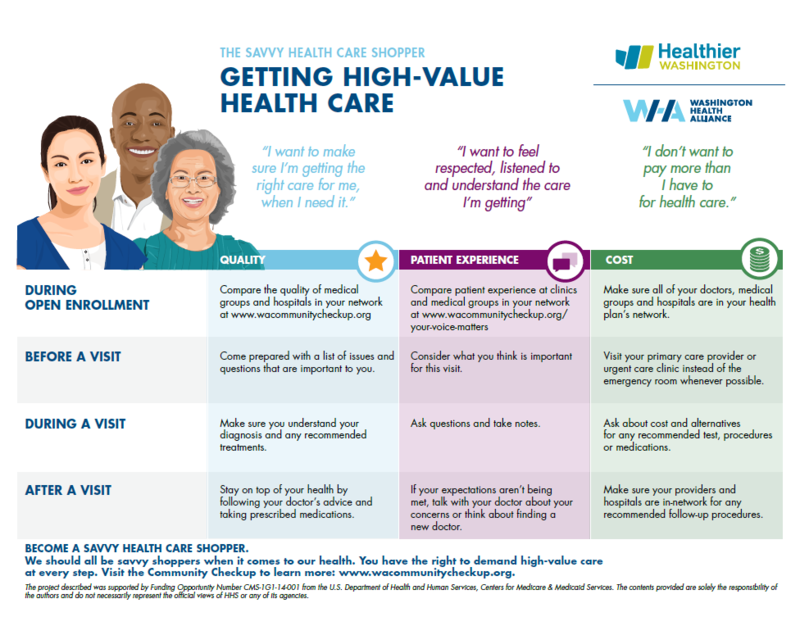 The Washington Health Alliance is partnering with the Washington State Health Care Authority’s Healthier Washington initiative to educate consumers on finding value in health care.